Purchasing from an Authorised Yamaha Online Dealer means you are purchasing more than just a great Yamaha product, you are purchasing peace of mind. Yamaha Music Australia carefully selects dealers to ensure you, the customer, are being sold genuine Yamaha products from dealers that understand those products. 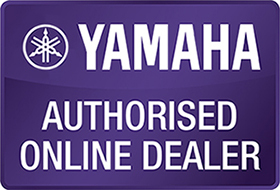 This logo ensures the online store is an Yamaha Authorised Online Dealer, so you can purchase with the peace of mind that you are receiving all of the benefits highlighted above, and avoiding the potential risks. Alternatively, there is a number of additional benefits that come from visiting the store of your local Yamaha authorised dealer. This includes the opportunity to experience our product and get face to face expert knowledge, to find store near you visit our dealer locator. Beware: we have been made aware of an unlawful practice by some unauthorized online operators. It appears that they are advertising ‘Yamaha’ goods at specific prices (often heavily discounted) when in fact they do not have any such stock. Once customers contact these operators, they are offered alternative products (i.e. non Yamaha products). This practice is called ‘bait advertising’ and is prohibited under the Australian Consumer Law. If you become aware of this, please report it to our staff or the Australian Competition Consumer Commission. See below for a comprehensive list of Yamaha Authorised Online Audio Visual Dealers. To learn more about the benefits of purchasing from a Authorised Online Dealer and the risks associated with buying from anyone else, click here.